I wonder how many of us were doing this? I was under the gun for Mother’s Day and didn’t complete the pattern to the last border edge, but my mother loved it anyway. Whew what a project! Those colors are fabulous! I would adore this as a gift! Bet I would have enjoyed the making too! Very nice work. Wasn’t this a fun project? Great instructions! I will be making another one soon. According to Ravelry there are almost 2500 projects linked to the pattern. 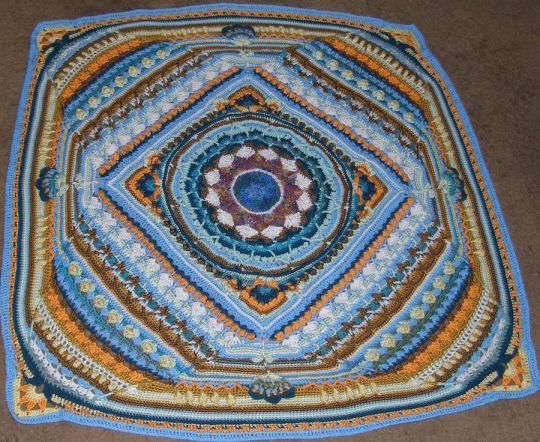 It’s been so neat to make this afghan with such a diverse, talented and friendly group of crocheters.